Some observers can rightly say the Nature has played its master strokes in the mountain regions, as happens with the hill stations and small hamlets and villages in the valleys. When the canvas is as big as Himalayas, Nature is bound to take privilege and so does the inhabitants of these places. On a Jeep safari covering Shimla, Spiti, Manali and whatever that falls in between them can act as a perception changer for people leaving in plains, making them follower of Nature for life. Himachal Pradesh has over the time evolved as a state catering to the adventure needs and quests to find Nature and tourists, Nature lovers, wildlife enthusiasts and adventurers are making most of the proffered opportunity. Jeep safari is one such offering to facilitate the adventure-hungry streak of some individuals on quest. The remoteness of the region provided much-looked-for solitude, away from the noise and crowd of city life. Valleys like Sangla, Spiti and Lahaul in conjugation with Sutluj and Spiti Rivers, glaciers like Barasigri, mountain passes like Rohtang and Kunzam, Nako and Chadertal Lakes makes for an excellent road journey. Small villages like Kaza, Kamru, Nako, etc and their hospitality as well as the simplicity are only to be felt and preserved in heart as long as the experience lives in mind, which is like forever. The monasteries of Tabo, Ki, Dhankar and Lalung are sights that are expected the day journey begins from Delhi. Arrival at Shimla ,Check in at hotel.rest of the day free for leisure activities .O/N stay at Hotel . Visit the Indian Institute of Advanced Studies, Sankat Mochan Temple and Jakho Temple in the morning. In the afternoon, take a stroll, shop and relax on The Mall & The Ridge. Travel to Sarahan visiting Rampur en route. On arrival, check in to the hotel. Visit the famous Bhimakali temple in the morning and then travel to the beautiful Sangla valley. En route, visit the fort at Kamru village. On arrival, set up the camp. Explore the remote Sangla valley and the nearby villages like Chitkul etc. Proceed to Nako. 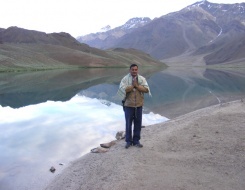 Visit the confluence of Satluj and Spiti rivers at Khab en route. Nako is a beautiful village on the banks of a lake. On arrival, set up camp. Travel to Tabo and visit the Tabo monastery is more than a thousand years old and is famous for its wall paintings and murals. It is also known as the Ajanta of the Himalayas. Then set up camp near Tabo village. 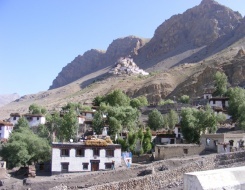 Visit the Dhankar and Lalung monasteries and proceed to Kaza and set up camp. Visit the Ki monastery and Kibber village. In the afternoon, travel to Tashigong village to see the Chao Chao Kang Nilda peak. Spend the afternoon exploring the lake. Travel to Manali over and Rohtang (3980m) Pass. 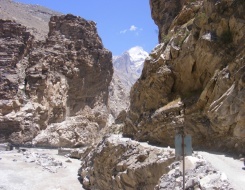 The drive provides you with some spectacular views of the rugged Spiti valley, CB ranges and Barashigri Glacier.